DRI is produced by passing hot reducing gases such as hydrogen, methane and carbon monoxide over iron ore (oxide), which is usually in the form of pellets or lumps. 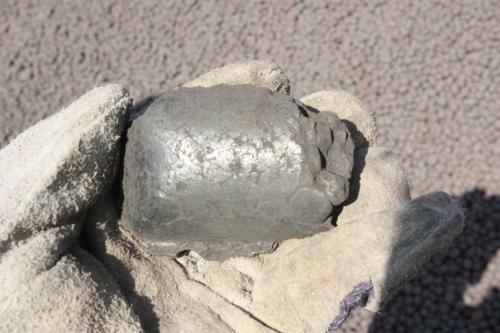 Although the process is conducted at high temperatures, these are still substantially below the melting point of iron. This means that the lumps and pellets retain their original shape, but are considerably lighter owing to the removal of oxygen from the ore. Therefore, the pellets and lumps have a hugely porous structure, which makes the material extremely reactive and prone to re-oxidation on contact with air and/or moisture. 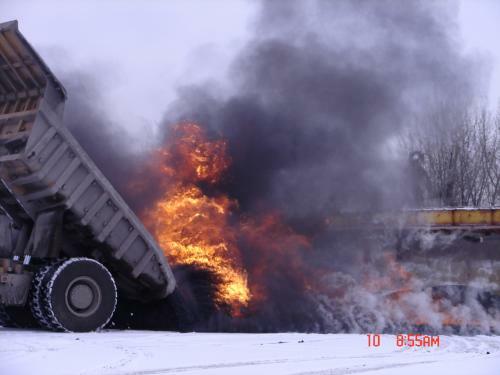 These oxidation reactions cause self-heating in the stow, which can lead to auto-oxidation in which cargo temperatures in excess of 900oC can be generated. Moreover, contact with moisture evolves hydrogen, an extremely flammable and sensitive gas that has caused explosions in the holds of several ships following its ignition. 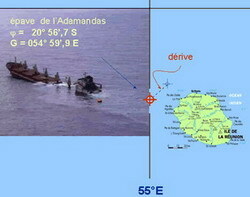 In 2003 the ADAMANDAS was deliberately sunk by the French Authorities following overheating of her cargo of 21,000 MT of DRI pellets. 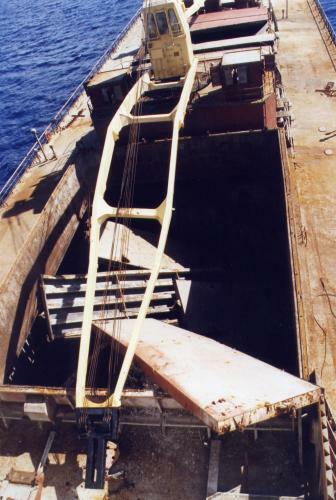 On 28th February 2004, hydrogen explosions in four of her cargo holds caused the total loss of the YTHAN off Colombia, together with the deaths of six of her crew including the Master. The hydrogen had been produced from a cargo of damp DRI fines. 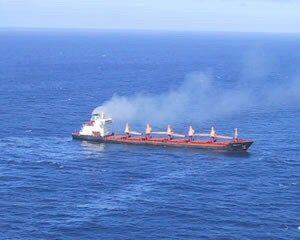 In the wake of this incident, a paper was submitted to the IMO Maritime Safety Committee (MSC) by the Marshall Islands, and the topic has been discussed at subsequent meetings of the Sub-committee on Dangerous Goods, Solid Cargoes and Containers (DSC). Eventually, new schedules were agreed in September 2008 and were adopted by MSC Resolution in December 2008 as part of the new IMSBC Code, which was published in 2009. The Code has been recommendatory from 1st January 2009, but will become mandatory on 1st January 2011. The IMSBC Code now categorise three types of DRI. The first, type DRI (A), is the less reactive, high-density variety of DRI that is known as Hot Briquetted Iron HBI, or Hot Moulded Briquettes HMB. The second type, DRI (B), is highly reactive, low density DRI in the form of lumps and pellets and cold moulded briquettes. The schedule now includes a new entry DRI (C), which is described as By-product fines and is intended to include all the materials generated as by-products in the manufacture and handling process of DRI (A) and/or DRI (B). The maximum limit on the moisture content is 1%. 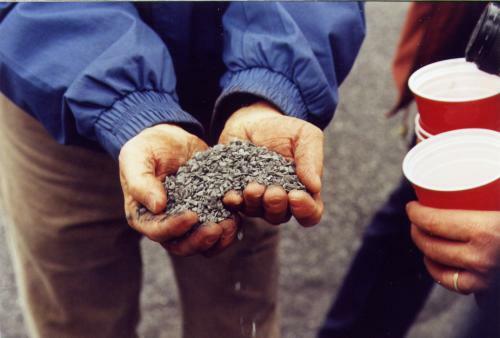 The average particle size is from 6.35mm to 25mm. Loading conveyors are to be dry. The moisture content must be less than 0.3% and must be monitored during loading. Carriage is only permitted under an inert gas blanket. The ship shall be provided with the means of reliably measuring the temperature at several points within the stow, and determining the concentrations of hydrogen and oxygen in the cargo space atmosphere on voyage whilst minimizing the loss of the inert atmosphere. The ship shall be provided with the means to ensure that the requirement to maintain the oxygen concentration below 5% can be achieved throughout the voyage. The ship's fixed CO2 fire-fighting system shall not be used for this purpose. The concentration of hydrogen in the free space has stabilised and is less than 0.2% by volume (i.e. 5% of the lower explosive limit, LEL). The average particle size is less than 6.35mm, and there are to be no particles greater than 12mm in size. "The reactivity of this cargo is extremely difficult to assess due to the nature of the material that can be included in the category. A worst-case scenario should therefore be assumed at all times." The carriage requirements are identical to those for DRI (B), including the 0.3% limit on moisture. "1.5.1 Where this Code requires that a particular provision for the transport of solid bulk cargoes shall be complied with, a competent authority or competent authorities (port State of departure, port State of arrival or flag State) may authorise any other provision by exemption if satisfied that such provision is at least as effective and safe as that required by this Code. Acceptance of an exemption authorized under this section by a competent authority not party to it is subject to the discretion of that competent authority. Accordingly, prior to any shipment covered by the exemption, the recipient of the exemptions shall notify other competent authorities concerned. (emphasis added). The door is therefore open for parties to seek exemption from any or all of the requirements for the carriage of this or any other cargo. The author is aware that "High Moisture" DRI Fines containing up to 12% moisture and 75% metallic iron are being offered for carriage without inert gas on the basis that the hydrogen that will be generated in the holds will be removed using the ship's mechanical ventilation. However, sea trials showed that hydrogen accumulated in the holds in explosive concentrations when the ventilation was suspended for a short period of time, as would be expected during bad weather. Moreover, the recommended ventilation regime would not have prevented the explosions that caused the loss of YTHAN. Members are therefore urged to be cautious when such a cargo is offered. Additionally, the author is also aware that some manufacturers are blending quantities of DRI fines with fines recovered from the un-reduced iron ore, and offering them as (non hazardous) iron ore fines. Again, Members are urged to be diligent and to exercise caution. 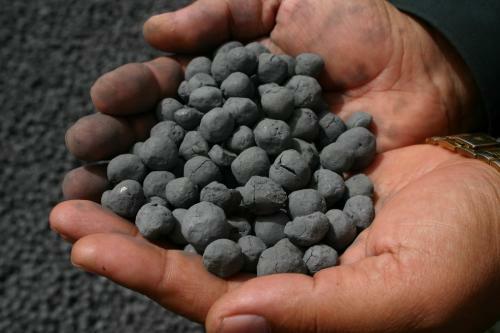 On the other hand, many grades of iron ore are prepared specifically for reduction in DRI furnaces, and are often referred to as "direct reduction iron ore pellets", or similar. These do not require any special provisions for transport by sea, and can be differentiated from DRI (B) by their chemical composition.